Millet is a small sized grain. Just soak in water for 2 hrs. Chop 1 big onion, 1 each colored bell peppers, spring onions. Keep a cup of boiled chickpeas ready. In a flat pan add 2 teaspoons of flax seed olive oil. Stir over a low flame. Stir, add rock salt & black pepper. Add boiled chickpeas & cooked millet. A guilt-free wholesome meal for dinner time. 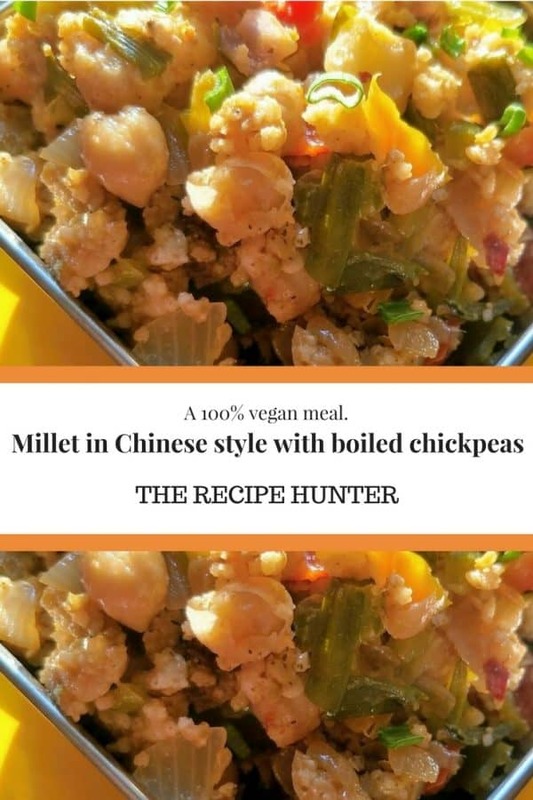 Millet in Chinese style with boiled chickpeas. Cooked in just 2 teaspoons of flax seed olive oil. Millet is beneficial for the heart, Prevents Diabetes, Lower the risk of cancer, Detoxify the body, Boost immune system, Improves muscle & nerve health.